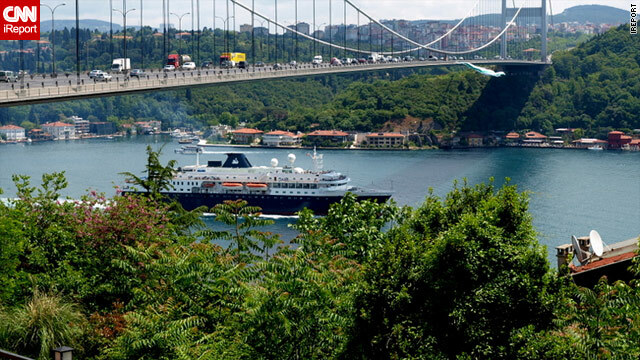 Seen from the European side of the Bosphorus, a ship passes under the Fatih Sultan Mehmet Bridge in Turkey. Iran's foreign minister says: "Iran and Turkey ... complete each other"
(CNN) -- Iran and Turkey signed a trade pact Sunday, one which Tehran said could be worth $30 billion over five years and signaled even stronger ties between the two nations. Both nation's leaders touted the agreement as something that could provide huge mutual economic benefit, according to their respective state media. Tehran, especially, played up the deal as evidence of a new era in relations. "Iran and Turkey are two countries that complete each other," Iranian Foreign Minister Ali Akbar Salehi said, according to Turkey's official Anadolu news. The agreement capped the nations' 22nd annual joint economic meeting, evidence that Tehran and Ankara have a long working relationship. Still, it comes amid Iran's nuclear tensions with the United States -- a staunch ally of Turkey. In an account from Iran's official IRNA news agency, Salehi said the agreement and other recent moves indicate that Turkey is committed to bolstering its ties with Middle Eastern nations. "Ankara is strengthening its relations with its neighboring countries, particularly the Islamic republic of Iran," Salehi said. The Iranian foreign minister further proposed an even greater union to advance both nations' interests, according to Press TV, Iranian state media. Turkish State Minister Cevdet Yilmaz noted that trade between his nation and Iran has risen from $1 billion to $10.7 billion in the past decade. Still, he said that it could go even further, with Sunday's pact to ratchet down protectionist measures and promote cooperation potentially instrumental to that cause. Also Sunday, Turkish Premier Recep Tayyip Erdogan met with the head of Syria, another U.S. nemesis, according to reports from state media in both nations. In an official statement published on Syria's state-run Sana news agency, President Bashar al-Assad said that he and his Turkish counterpart "stressed the importance of continuing work and coordination by the two countries through high-level transparent dialogue." In a speech marking the laying of the cornerstone of the Friendship Dam, along the nation's border with Syria, Erdogan said that Turkey wanted peace, stability and prosperity, according to an Anadolu report.